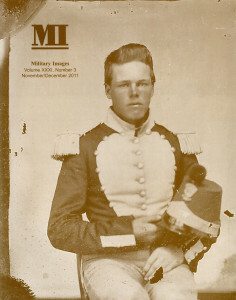 Uniformed in a coatee with light colored facings, this useful militiaman’s portrait was made in the late 1850s. Tom Gaard collection. The editor introduces one of the feature articles, “Peach-Fuzz” and “Gray-Beards” by Mike Fitzpatrick. On a somber note, the editor reports that passing of former contributing editor Michael J. Winey, 70, who was the Chief Photo and Map Archivist and Chief Curator of Artifacts of the United States Military History Institute in Carlisle Barracks, Pa.
Corp. David B. Foster of the 5th Marines was killed in action on June 12, 1918, only six days after he survived the intense fighting in France at Bellau Wood. Thus began an odyssey of sorts to bring his body home. Despite numerous obstacles and bureaucracy, Foster’s parents and others finally brought his remains home to Dravosburg, Pa., in 1921. Selected images and captions of pilots who flew during World War I include Hamilton Coolidge, a great-great-great grandson of Thomas Jefferson killed in 1918, Kenneth Russell Unger, a New Jersey native who joined the Royal Flying Corps after being rejected for U.S. service, and Chester Ellis Wright, a Massachusetts native who dropped out of Harvard to join the service. A dozen images from the author’s collection illustrate the young boys and old men who came out to join the Union army. Included in the group is 16-year-old Henry Campbell of the 18th Indiana Light Artillery, 62-year-old Joseph Wild of the 15th Ohio Battery and 12-year-old Johnny Clem, who was credited with shooting a Confederate colonel during the Battle of Chickamauga. A peacetime sheriff born in Hamilton County, Ohio, Campbell enlisted in the 19th Indiana on July 4, 1861. He started as a second lieutenant and soon advanced to captain of Company I. He participated in the Second Battle of Bull Run, Antietam and other actions until he resigned in October 1862 due to poor health. He died in 1885. An image of a corporal posed outdoors in front of a cannon is one of a series of images of soldiers of the 22nd New York State Militia. Though the image has been published many times, this is the first time it has been identified. The corporal is Joseph H.P. Inslee, who served for a few months in 1862. Holland native Harry Kiekins served in the Union navy from 1862 to 1867. His service took him from the coast of Alabama to the European Squadron. Perhaps his most memorable moment during the war was his participation in the capture of Fort Fisher, N.C., from Jan. 13-15, 1865. The author shares his story of two hard plate images he purchased of what appeared to be the same Union infantryman identified only by the regimental number 7 and company letter H on his Hardee hat. Upon closer examination however, he suspected that the images were twins rather than the same soldier. Further research led to a tentative identification of the images as Albert and Alfred Hills, who served in Company H of the 7th New Hampshire Infantry. The son of the legendary Confederate cavalryman, born in 1860, was originally named Phillip St. George Cooke Stuart in honor of his maternal grandfather. But after the Civil War began and the grandfather remained loyal to the Union, Stuart renamed his son J.E.B. Stuart II. Though fascinated by all things military, young Stuart became a banker. He did serve a stint as captain in the volunteer army during the Spanish American War. He died in 1930. The story is illustrated with six images of Stuart. In “The Veteran Reserve Corps,” McAfee begins by relating an anecdote about the 18th VRC in the summer of 1864. Ordered to march 25 miles to change their base, the colonel commanding replied to the general who issued the order, “Tell the general that my men are cripples, and that they can’t run away.” What follows is an accounting of the organization and distinctive uniforms of the Corps, illustrated with 14 cartes de visite. In this quarter-plate ambrotype from the Liljenquist Family Collection at the Library of Congress, two Confederate soldiers ready to do battle, wear identical uniforms, with cuffs and braiding tinted red. A handsome Union second lieutenant strikes a pose before an artistically painted backdrop. The image is housed in a black thermoplastic frame. Ken Bertholf collection. A tintype of Thomas Eubanks of the 7th Wisconsin Infantry, posed with his wife and daughter, is notable for their expressions and the affectionate way they hold hands. Brian Boeve collection. A stuffed rooster dominates this portrait of an unidentified Veteran Reserve Corps soldier. The Uniforms & History department has more on the VRC. Michael J. McAfee collection.